Go see a complete list of T5 peaks climbed in May 2005. How to get there: The most convenient way to reach Troms, is by a two hour flight to the city of Tromsø from Oslo, Norway. 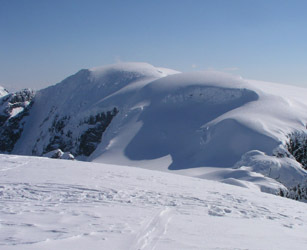 Jiehkkevarri is the highest in Lyngen as well as in all of Troms. From Tromsø, drive 51 kilometer south along Hwy. E8 (direction Nordkjosbotn), to Laksvatnbukta. Make a left turn there and continue 17 kilometer to the small community Lakselvbukt. From Lakselvbukt, two roads fork south ignore these and continue approximately 7 kilometers north along Sørfjorden. You should be in Indre Holmbukta, the road crosses a main river, Storelva on a bridge at this location. We parked on the left side of the road immediately before this bridge, location north 69:28.162, east 019:41.806, just a few meter from the fjord. There is further parking on the right a few hundred meter ahead where a small farm road forks right. Additionally, there is parking even a bit further near the hill Brentberget. It takes about one hour to drive from Tromsø to this trailhead. Lakselvbukt has a small restaurant (on your left after you pass the church) and a very ideal place to stay for any party that is headed for Jiehkkevarri. Contact Birger Elvevoll, phone (+47)77690433, I stayed in his nice cabin for two nights, it is only 5-6 kilometer from the trailhead. His house is red, at the second turnoff (right hand side) after you cross into the 50 kilometer speed zone in Lakselvbukt. A more detailed, illustrated Trip Report is also available. This report provides complementary information mainly via many photos, to the Route description below. Route description: From the trailhead, head east, but south of Brentberget, then up along (in winter/spring) on top of Tverrelva. At elevation approximately 350m, start heading up the very narrow, distinct valley that comes down on your left, this valley goes off (and up) to the north-east. The steepest part of this valley is just where some big rocks can be seen in the spring. 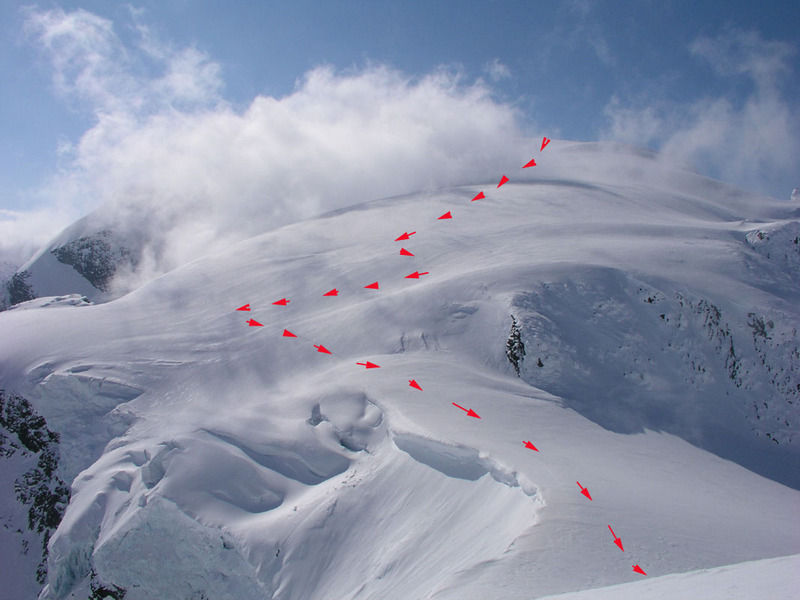 Consider possible avalanche hazards, avalanches do happen in this area both from the left as well as from the right. Higher up, the slope eases and you enter an area where the valley makes a turn to the right. 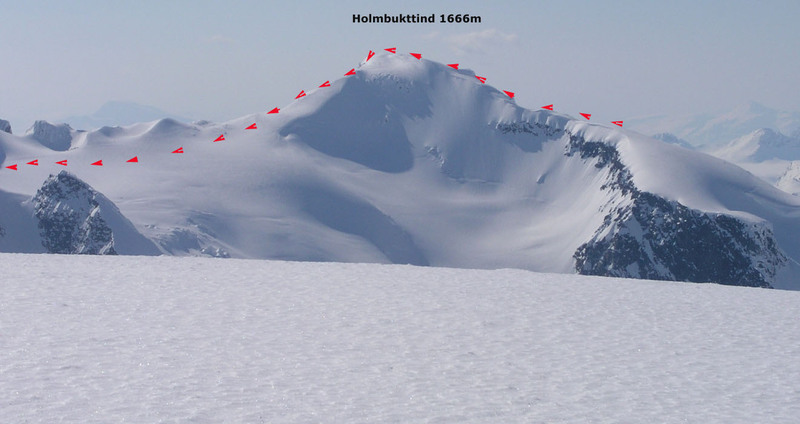 Notice the distinct, lowest point in the north ridge of Holmbukttind. Continue the climb towards a point slightly right for this saddle. The hill gets steeper as you climb and we rested at about elevation 1220 meter where you meet some cliffs. From here (loc: N69:28.573, E019:47.445), we continued on foot with the skis on the pack, starting out uphill on the right hand side of the cliffs. The slope is about 45 degrees in the beginning, less higher up. Altogether, you gain 300 meter in about 400 horisontal meter. On the ridge (loc: N69:28.567, E019:48.028), continue to ski uphill directly south to the summit of Holmbukttind, 1666 meter. Note that this peak is not named on the M711 map. From the very summit, locate a ridge that heads down slightly south of east. First, by a short descent to a somewhat lower summit shoulder, then down the ridge. This ridge starts out quite narrow, ski with care, soon is broadens and allows for nice and easy skiing down to about 1500 meter on the glacier that is located 2 kilometer west of the Jiehkkevarri summit. The route crosses from M711 map 1533-I, Lavangsdalen to map 1633-IV, Storfjord at this point. This glacier is steeper as it climbs east, ascend it by first gaining elevation going east, then turn and continue to climb south gaining the flat shoulder about 600 meter west of point 1738. This ascent is about 80 vertical meter as you enter more gentle terrain around the 1600 meter contour level. The hard work is now done, continue east while skiing south of point 1738, then contour into the saddle east of this point and head along the broad, gentle ridge to the north-east the last kilometer to the summit of Jiehkkevarri. One may return the same way, however a much nicer alternative which really consitutes a traverse of the Jiehkkevarri mountain, is to continue to the white dome Kveita, 1751m, located about 3 kilometer to the north-east of the Jiehkkevarri summit. Enjoy the nice skiing as you descend about 400 vertical meter towards the Jiehkkevarri-Kveita saddle. Pay attention to the terrain as you approach this saddle, there are some cliffs above the saddle, circumvent these by skiing right (east), then complete the descent on a descending traverse into the saddle heading north. Be aware that the glacier drops steeply on your right side in this final section. The slope up to Kveita appears steep when viewed straight on, however, it is quite reasonable to ski. Make a few switchbacks as you climb this hill, the slope is a bit more gentle higher up. Take time to enjoy this third summit of the day, from here on the route is mainly downhill. The next few kilometers offer very scenic skiing along the ridge that heads slightly west of north. The marked (elevation) points 1652 and 1666 are along this ridge. Make sure you do not descend the steep glacier north of Kveita. Ski slightly west of point 1652 and continue to a point slightly west of point 1666. This section of the route has cornices off to your right, there is no need to ski anywhere close to this side. From near point 1666, the next objective is to descend down to Fugldalsbreen 400 vertical meter below. There are two possible routes, both are steep glaciers. To make things slightly more involved, this is where we again cross from M711 map 1633-IV, Storfjord to map 1634-III, Lyngen. I had no information about which glacier to prefer, so we descended the one that starts out west of point 1666. 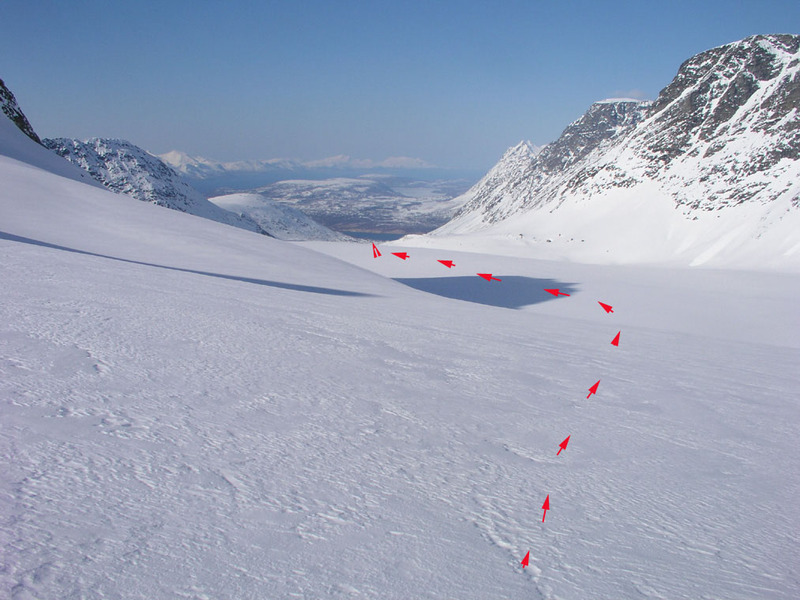 The best route here is to first descend a bit directly north-west of point 1666, then traverse downward and into the glacier itself (going west). This traverse is above some steeper rocks, but gets you onto the glacier in a distinct valley shaped area. The slope is steepest at the top, then gradually becomes more gentle as you descend down to Fugldalsbreen. The bottom of this slope is at elevation 1268 meter, location north 69:30.126, east 019:53.873. (Note: It may be quite possible that the alternative glacier furher east is at least as good if not a better alternative. Viewed from below, this glacier appears to be steepest near its middle section with more gentle slopes below and above. To reach it, continue a descent north from point 1666 until you reach the 1600 meter level, then continue descending towards north-west. The slope is easy down to 1500 meter, then gradually steeper to about 1300 meter before a more gentle finishing section the last 100 vertical meter. Fugldalsbreen is a nice place to be, enjoy it before proceeding to the distinct pass, Fugledalsskardet on the north-west side. When we skied here, a big cornice had formed just before the pass. One could ski a steep traverse near the pass or just downclimb this steep snow before gaining the last few vertical meter to the pass itself. The next 3 kilometer descends the Fornesbreen glacier, first very gently then virtually flat heading north. At the end of this glacier, the terrain drops more steeply another 300 vertical meter to Fornesbotn, the inner part of the Fornesdalen valley. However, this slope is not difficult and can be skied almost anywhere. What remains is now 4 kilometer with pretty flat valley, then a final kilometer down to Furumo, the last house on the road from Lakselvbukt. Unless you have made advance plans (recommended), the last challenge is to secure transport back to the trailhead below Holmbukttind. The distance is about 20 kilometer and after such a very nice Jiehkkevarri traverse nobody deserves to walk back along the road. Hopefully, you will locate somebody from whom you can purchase return transport. Note: This route can clearly also be done in the reverse direction, however, I do think the best route is as described in this report. This route is not very difficult, but involves extended glacier crossings, steep terrain and mountains where alternative routes are limited. Any party should be familiar with glacier travel and be equipped to safely travel in an area where there could be dangerous crevasses. One should reserve this trip for a day with stable weather. 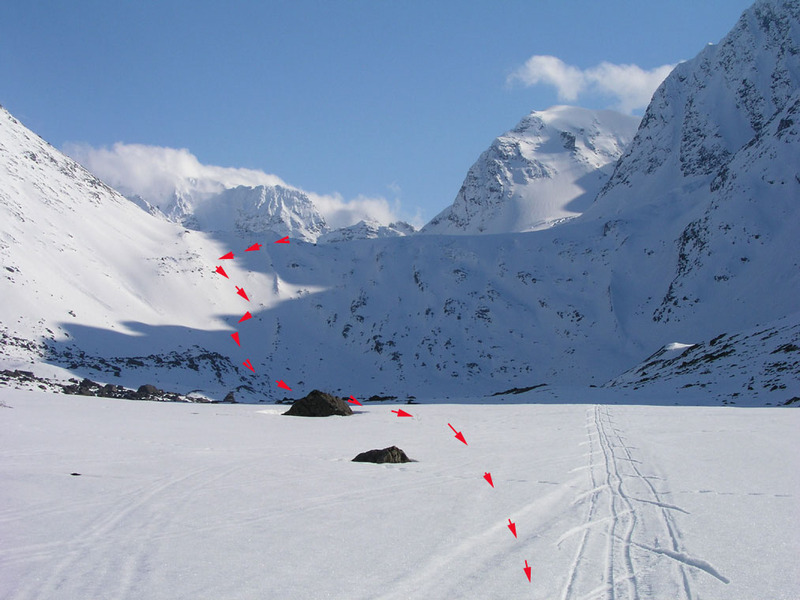 Instead of going left up across Holmbukttind, one may continue straight ahead up the main valley and then continue up the glacier called Blåisen (Blue Ice). This glacier is known for serious crevasses in the upper steep part between 1200 and 1500 meter of elevation. This is a quicker route than the route traversing Holmbukttind. Yet another approach is to climb the South-West glacier just opposite from the impressive Lakselvtindene. In this case, you need to head in the valley Andersdalen (along the Storelva river), then ascend up into the bowl below the glacier. This route also requires a roped team up the glacier. Harald thinks this is the most spectacular route. On the route down to the saddle connecting Jiehkkevarri with Kveita, there is a very nice viewpoint called Balkongen (The Balcony), this is before (south) of the saddle at elevation 1460 meter above the steep east wall of Jiehkkevarri at this location. This is more or less straight south of the connecting saddle. A great place to make a break and have lunch while enjoying a fantastic scenery. Harald further confirms that one should take the second glacier, that is the one further north-east, in order to connect down to the Fugldalsbreen glacier (we took the "wrong" one). An alternative exit from here, instead of skiing north to Fornes, is to make a big U-turn on the Fugldalsbreen glacier and follow it down. One should then follow the right hand side (west side) and cross the side moraine (move west) before the very lowest part of the glacier. This exit route will take you by the lake Fugldalvatnet (357m) and back to the road at Ytre Holmbukt. You are then within walking distance of your point of departure (your parked car). Finally, if you complete the traverse all the way to Fornes (as we did), but need transportation back to your starting point, one can call Mr. Stakkenes (taxi-service) on phone number 77690222 or 91885582. Tell the size of your party and he will pick you up with a taxi, a van or a bus. Comments: This was the first peak on my T5-trip (Toppturer i Troms 2005). Here is a complete summary of all peaks climbed on this trip. I did this climb with my friend Torstein Skage. We started from the fjord at 0720, arrived at the summit after 5 hours at 1320. My GPS showed 1841 meter, 7 meter too high. However, being a glacier top the snow depth clearly varies, it is not unlikely that the summit may have 5 meter of snow in late April. We spent 30 minutes at the summit, then decided to do "Le Grand Traverse" by a continued traverse across to the peak Kveita, then along the ridge north and steeply down to Fugldalsbreen, through the pass Fugledalsskardet and down Fornesbreen and the Fornesdalen valley, ending at the fjord on the far north side of the mountain. Including several nice breaks in the exceptionally nice weather, we completed this traverse of Jiehkkevarri at 1720, exactly 10 hours after the start. We ended the trip at the last house along the road and fortunately, a car with a ski rack parked outside. I knocked on the door and asked if the owner would be able to drive us back to our point of departure, a distance of approximately 20 kilometer. Obviously, we wanted to pay for such service, and he accepted half of what I offered for the help. Shortly, we were back were we started, a very memorable and successful trip had come to an end. I arrived in Lakselvbukt late Friday and was caught by surprise that there was no place (like a gas station) to buy breakfast/lunch for the following day. However, when having dinner at the small local restaurant, I asked about this and the friendly, helpful locals immediately came to my rescue. The lady arranged for me to pick up a fresh bread at her nearby house, while another guest offered me a kilogram of fresh shrimp from his catch of today. Thus, after spending some time Friday night peeling the shrimp, I carried a half bread and a half kilo of fresh shrimps to the Jiehkkevarri summit. Quite unusual mountain food, but very tasty and a hearty welcome to the Artic (friendly) folks and (spectacular) peaks of Troms. This was the first climb in my T5-trip (ToppTurer i Troms 2005). 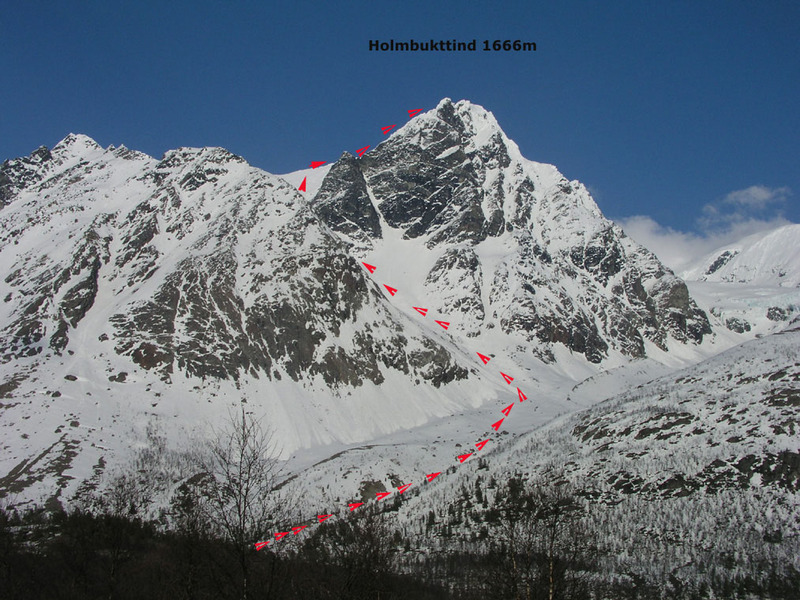 This was a planned trip to climb high prominence peaks in Troms, Norway in the fourteen days from April 30th. to May 13th. 2005. An ambitious goal of 10 peaks had been set, however, this would depend on near perfect weather conditions. T5 could not possibly have started any better, a great classic traverse in impressive formations with perfect weather! T5 continued the next day with Rasmustind.